The mountains around San Luis Obispo Bay area hide Avila Beach very well. 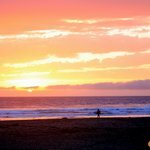 But if you’re willing to get off the beaten path and get off the freeway you will be rewarded greatly with stunning views of the ocean and a relaxed atmosphere in one of the little known California beach towns. Avila Beach, California is the perfect beach town. It’s small, clean and simply beautiful! Avila Beach is one of those places that if you don’t know about it you will pass right by it. It is a stunningly beautiful place but it’s well hidden from the freeway that passes just ten minutes east of it. Come along with me as we explore the best things to do in Avila Beach. See more pictures from Avila Beach, California. Avila Beach is a true beach town, so enjoy the beach and the water on a sunny day. Walk on Front Street and enjoy lunch or dinner at one of the many restaurants. Walk on the Avila Beach pier and enjoy the view of San Luis Obispo Bay. Especially if you have children, visit the Sea Life Center located right off Front Street next to the children’s park. They have lots of large fish tanks and very friendly staff. Take a short drive to Port San Luis, just a mile down the street. You can actually drive on the pier and enjoy amazing views of the area and get very close to the many sea lions in the area. Children especially love this place! What do you do in a beach town? Well, you go to the beach. The sand at Avila Beach is very fine and it’s very pleasant to walk on. If you get a sunny day, just sit on the sand and enjoy the sun and the water and take in the natural beauty of San Luis Obispo Bay. It’s just stunning! Avila Beach, California – The beach and pier at Avila Beach. Our children enjoyed very much the children’s park that’s right on the beach next to the pier. It has swings and slides and other “toys” for active kids. In addition, just off Front Street, there is an additional park for children that has more stuff for kids to do and bounce on. These will certainly wear down your children and hopefully fall asleep in the car for the ride back home. Avila Beach is a small town…I mean really small! If you’re at the beach then you have pretty much seen everything there is to see in Avila Beach. However, if can also relax and have lunch or dinner at one of the few restaurants that line up Front Street. You will enjoy good food and beautiful scenery. The restaurants on Front Street are obviously more expensive than the ones you find on the few side streets. So, the choice is yours, depending on your budget. Either on the way to Avila Beach, or when you leave Avila Beach, you will notice a steep road off Avila Beach Drive. There is a sign that indicates Cave Landing. Take the narrow and winding road up the mountain until you reach the mountain top where you can park your car. You can then walk close to the edge of the cliff and just take in the amazing views of San Luis Obispo Bay. Avila Beach, California – Amazing view of the San Luis Obisbo Bay from Cave Landing near Avila Beach. The easiest way to get to Avila Beach is on the 101 Freeway. As you pass Pismo Beach, look for the exit indicating Avila Beach Drive. Then follow Avila Beach Drive all the way as it winds its way down through the mountains to Avila Beach at the ocean. This is one very scenic drive and you should drive slowly in order to enjoy it. If you are in the Pismo Beach area already, just follow the road through Shell Beach leading to Avila Beach Drive. This road is just beautiful, with lots of spots on the edge of the ocean where you can enjoy amazing views of the ocean and marine life. Map of Avila Beach, California and surrounding area. 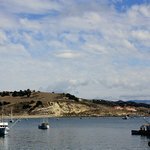 Is it worth visiting Avila Beach, California? 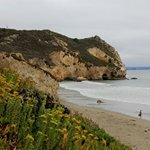 Avila Beach is a great day trip from Pismo Beach or San Luis Obispo. The views and the small town feel really relaxes you. If you happen to be in Avila Beach on a sunny summer day (which is pretty much every day), then you’re in for a treat for all your senses. Avila Beach is also a great place for children because of the great children’s parks and the interesting Sea Center which provide enough activities for children. All in all, Avila Beach is a great tourist destination.